Never give up! Never give in! We gotta fight for what we believe in! Put to the test! Together we’ll win! This is the Beyblade Burst Evolution! Our Beyblade party planning is continuing today with a list of essentials Beyblade party ideas. To start with, we are going to have some blatant self-promotion of the recent Beyblade printables that we have posted; then we will look at what else is out there on the world wide web. 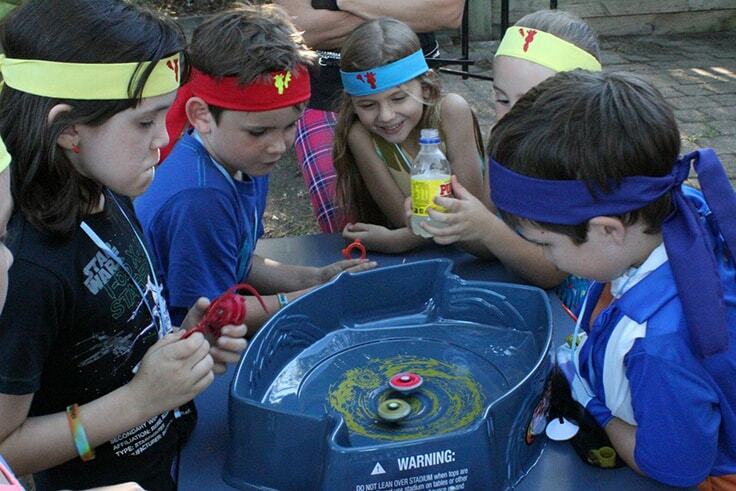 The first thing a Beyblade themed party needs is a Beyblade inspired party invitations. 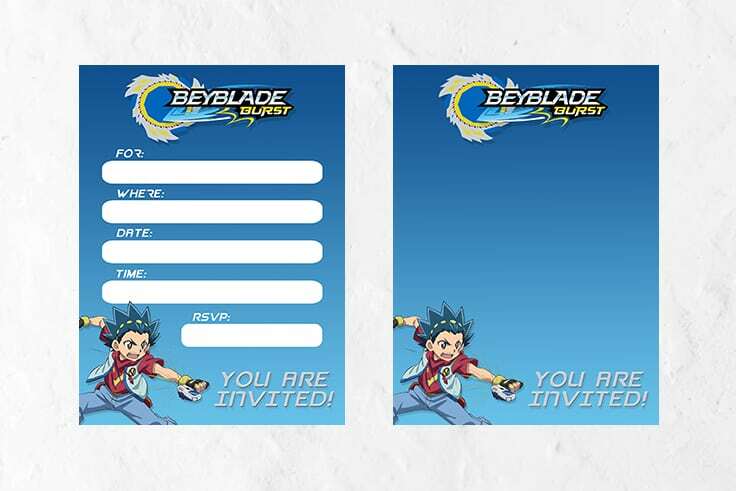 You can download our free Beyblade Party Invitation to get your party off to a free start! We have two design options, one with white boxes that you can write or edit to put on your party details, and the other one is a blank design where you can put your very own invitation wording if you want to. 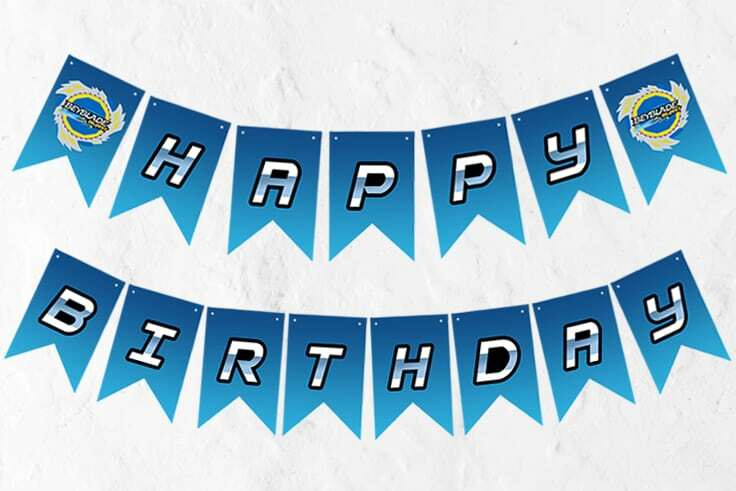 After downloading your free invitations, you can hop on over to our second Beyblade post to download some free Beyblade party bunting. 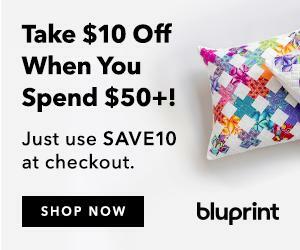 You can print this bunting on your home printer. Whether you hang it on the wall or attached on the dessert table, bunting gives any space a party feel. 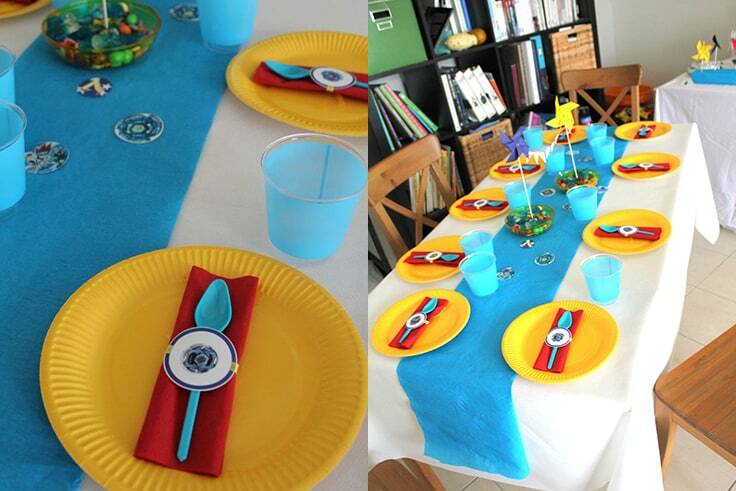 Below are some party photos you can get inspiration where to place your Beyblade Party Buntings. 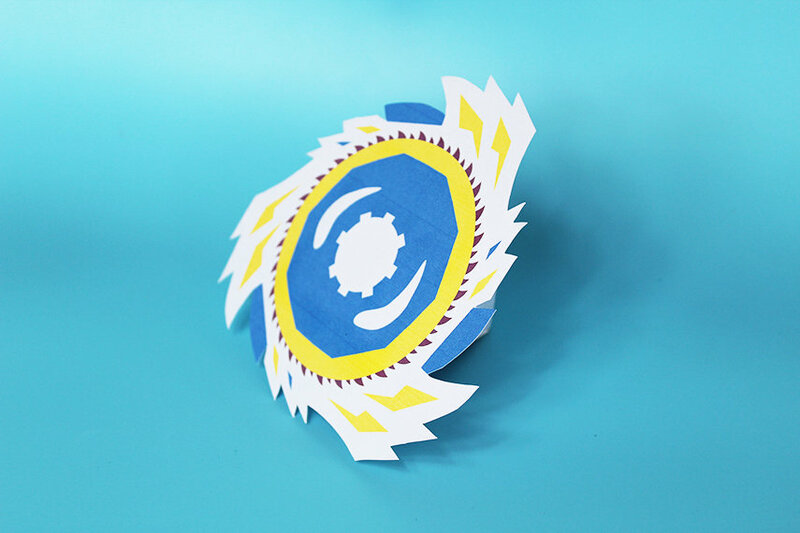 These cute Beyblade serviettes are a simple way to bring your Beyblade theme to any meal. I always tend to want to go a bit overboard with my party themes, so I think that this simple idea that won’t break the bank and keeps everything things looking great. If you want to add more decorations to your guest table, then you can add some table centerpiece. 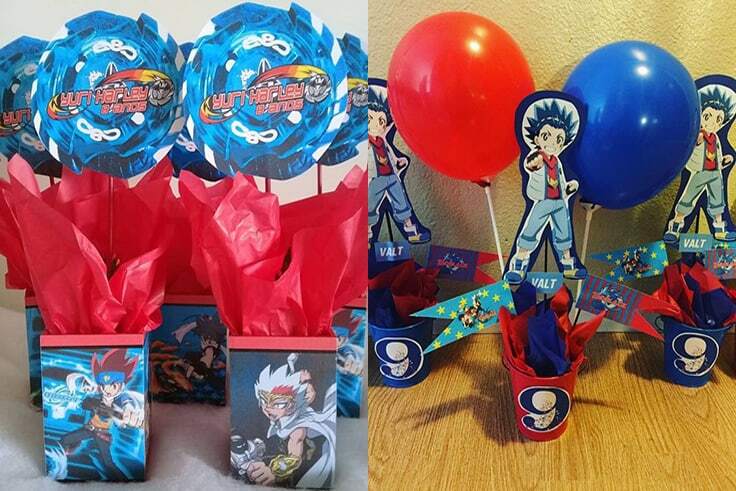 These Beyblade centerpiece ideas are perfect for that! It looks cute and easy to make. All you need are balloons, printed Beyblade icons, some crepe papers, and box or buckets to use as a base. You can be creative in making your own centerpiece. You can add table numbers if you are planning to throw a big party with a lot of tables, and you can also add names of your guests on the centerpiece. The above photos are from Pinterest, but unfortunately, there is no longer a link to the original story so I cannot credit the masterminds behind these creations. A birthday party will not be complete without a birthday cake! Since we are into Beyblade themed party, a Beyblade inspired cake is one of the most important things to really embrace the theme. 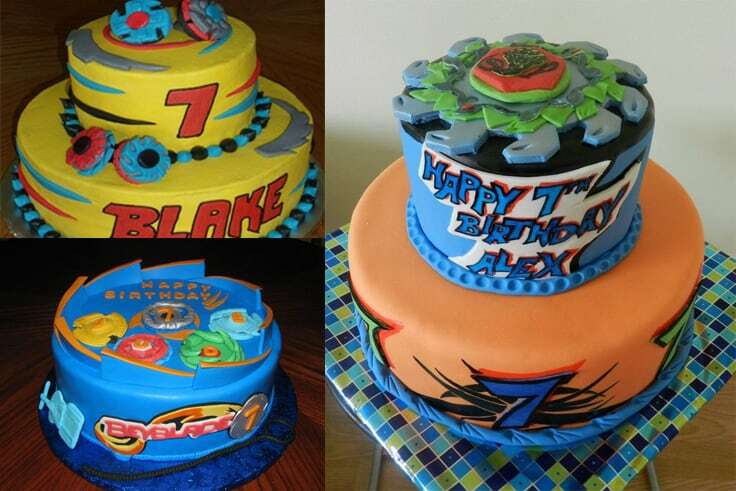 You can get inspirations from this Beyblade cake designs from Cake Central. Alternatively, you could buy a ready-made Beyblade fondant topper from Etsy and just stick it on top of a homemade or grocery store bought a cake. This is a great way to save some money and still have a professional looking cake. Another dessert you can add to your table is Beyblade Cupcakes. Cakes and cupcakes are like soulmates; this duo makes any birthday table looks fantastic. 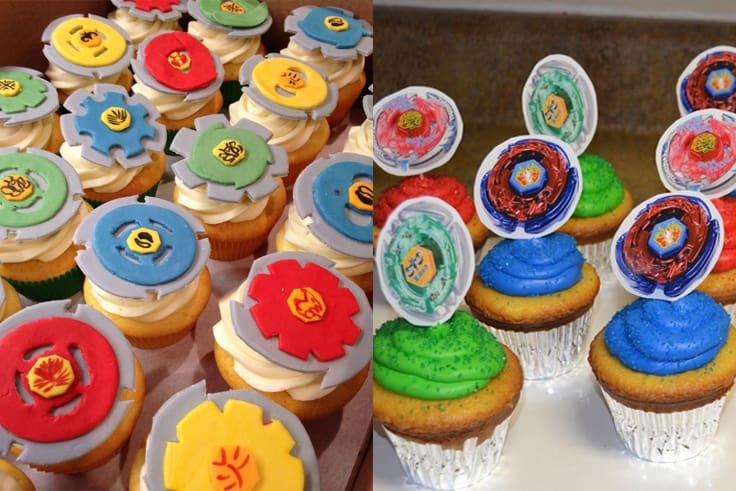 When you prepare Beyblade cupcakes, you can either choose an Editable Beyblade topper or the paper one. Whatever you choose they will both look great with the Beyblade theme. These Beyblade cookies are just too cute not to add on your food list. If you are crafty around the kitchen, you can make your own Beyblade cookies, or you can outsource and buy some on Etsy. 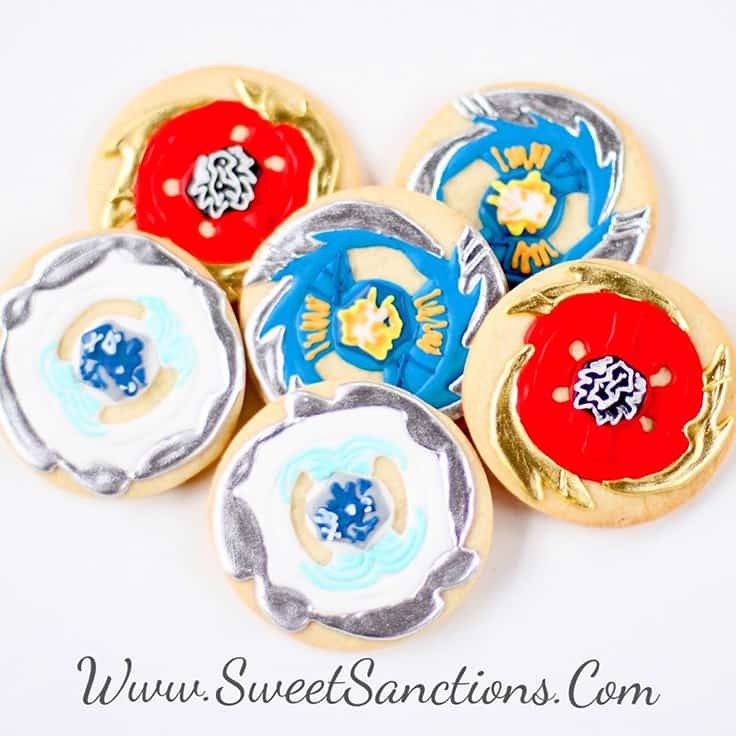 These super cute Beyblade cookies and would be a great party take homes too! So much for party food, it’s time to talk about party drinks! 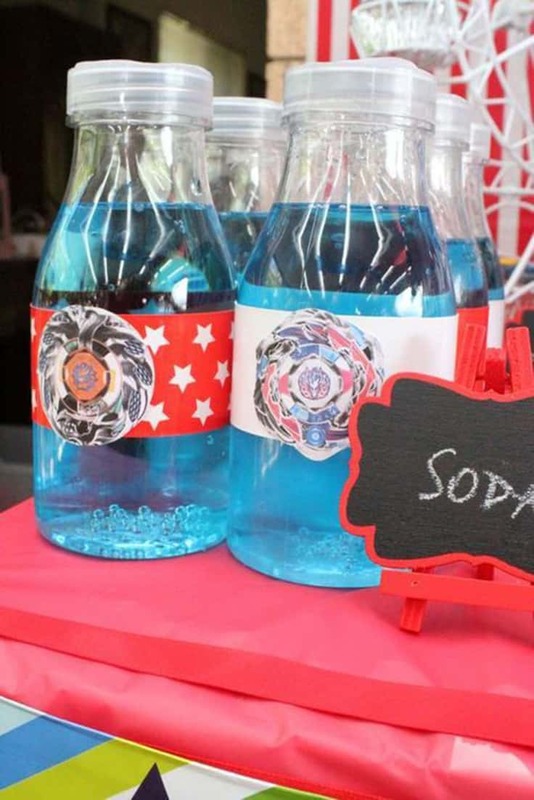 This cute Beyblade soda drink idea is a fun way to customize your drink with your Beyblade theme. If you are trying to maintain a handle on the sugar and soda is off the menu for your guests, then just use water! When the game is over, and it’s time to give your guests extra treats to bring at home, you can download and print our Free Beyblade Party Treat Box to use for your party and put your yummy treats inside. It’s a cute and unique party treat bag to use for your Beyblade Party. You can even spin it like a real Beyblade if you want! 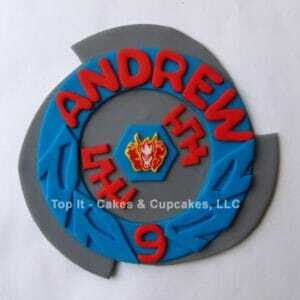 Within the Beyblade treat box post, you can also find a template for kids to design their own Beyblade top for the box. So depending on the age of your guests, you could set this up as a party activity in-between all of the Beyblade battling. I know that printed thank you cards can be a bit old school, but I still love giving them and getting them. 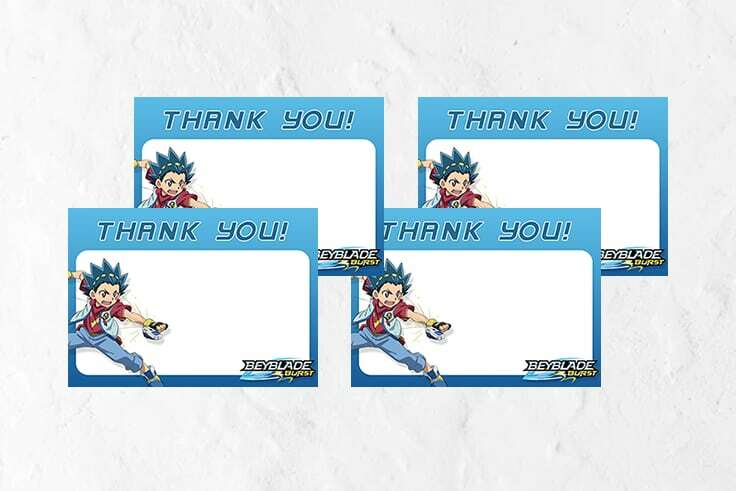 If you want your child to send a thank, you note to anyone after their party these Beyblade Thank You Cards are free to download. 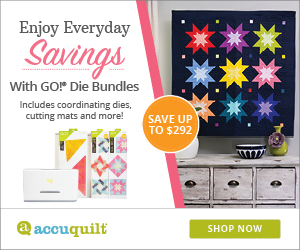 Lots of white space included so you can customize to fit your needs. So that’s it, my complete list of Beyblade party ideas. 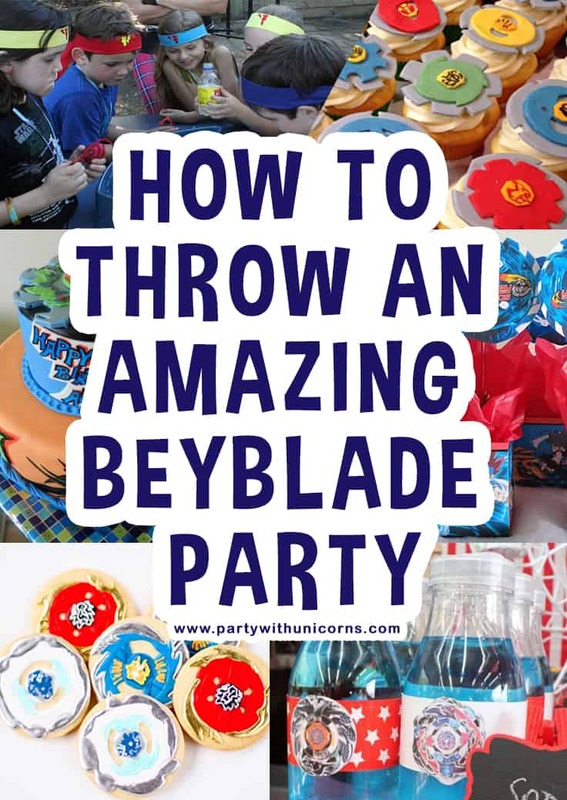 I hope this list will give you lots of great ideas to start planning a Beyblade themed party for your child. If you are planning a themed party soon and need some help pulling together some ideas or crafts, don’t forget to leave a comment! Its always so much fun working on parties together!